Betty Blue Eyes by Petts Wood Operatic Society. The parts of Gilbert and Joyce Chilvers are played by the very capable Neil Stevens and Hannah Ockendon-Rowe. Steven’s and Ockendon-Rowe are also frequently joined on stage by ‘Mother Dear’ played by Anne Ireland. The 3 of them on stage together provided some of the highlights of the show, in particular ‘Pig, No Pig.’ All of their characterisation was nicely done, from their contrasting body language to their amusing family dynamics. Hugo Dowlen as Henry Allardyce also showed good comedy timing, especially in his love over Betty. A special mention must also go to Grace Baker who played Veronica Allardyce in the Friday night performance. For a young child to get the Yorkshire accent so spot on must have taken a considerable amount of work and attention to detail. Her performance of Veronica was confident and assured. I look forward to seeing her in more as she grows older. The star of Betty Blue Eyes should of course be Betty herself. In Petts Wood’s version this was simply a motionless pig. Whilst I appreciate budget is limited, imagination is not and the immobile element of the pig meant many potential visual elements of the show were lost. The cast also needed to be aware that they often drew to the audiences attention the fact that this pig wasn’t real, for example with the manner and ease in which they lifted Betty. The show wasn’t lacking in imagination altogether. When Joyce and Gilbert Chilvers arrives on stage in their car, the car itself was made up of props, a nice touch which added interest. A highlight of the show was ‘Lionheart’ set in the Primrose Ballroom. In this number we got to see Emma Clandon as Kitt really dance. This number was nicely choreographed by Carrie-Louise Knight however it was a shame that with dancers of this talent in the cast there wasn’t more challenging choreography elsewhere. Even if the whole ensemble couldn’t perform trickier choreography it is often possible to create different layers of dance within a number, which I would have liked to see to occur more often. At times attention to detail from the director was needed a bit more. Small things such as Gilbert Chilvers simply throwing a prop off stage or Joyce’s dress, after her impressive on stage costume change, being left in the middle of the stage until halfway through the number are examples of this. Small details like this would have helped to elevate the show to the next level of professionalism. 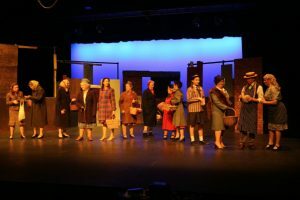 Overall Betty Blue Eyes was a brave choice of shows for Petts Wood Operatic Society, a society that previously focused on more traditional shows but a risk that paid off. A fun night out with the 3 leads being a huge part of this enjoyment. I look forward to see how Petts Wood Operatic Society develop in this vein with Dirty Rotten Scoundrels. If you liked this review you may also like my review of Legally Blonde, Drowsey Chaperone and Dinner. To find out more about Petts Wood Operatic Society you can visit their website.